As I mentioned last week, I’m re-sharing and completing The Artist’s Way Series again this year. Last week, we looked at the introduction. We’re on to Week 1 one. to get the whole picture. This week we focus on realizing how our inner artist needs to recover. Perhaps, down the years our creativity has not been encouraged sufficiently. Often our family of origin has allowed us to pursue our creative interests as hobbies, but told us to be practical when it came to our careers, etc. We’ve often heard expressions like: ‘Stop dreaming! Your head is in the clouds!’ ‘Be practical’, ‘Grow up’. Slowly, we learn to suppress our creative instincts. But we’ve got to realize someday that we’ve been conned. It’s never too late to start over and we must. 1. Identifying our core negative beliefs and countering them with affirmations. – I’ll never be good as other artists. – I can’t make a living this way. – I may not be as good as I think I am. – I’ll embarrass myself and my family. The only way to counter these negative beliefs is to use affirmations. It’s funny how we are so comfortable with thinking and saying negative things about ourselves, but the moment we try to use affirmations, we feel uncomfortable. For example, take the affirmation, ‘I am a fantastic writer’ and say that aloud. You’ll find that negative voice in your head saying, ‘Who are you trying to fool?’ or ‘There are so many better writers than you’. Try to find the source of that voice – when did the comparisons start, who said those negative things, how did you pick them up. I can assure you that this is hard work, but totally worth it. 2. Identifying our Hall of Monsters and sending them for a walk. Think of 3 people who, intentionally or not, said negative things about your creativity when you were growing up. Three specific people. Write down their names. Now select one of these individuals and attempt to recall all the details about what happened. Write it down. The more details you can recall about the situation- the setting, their words, how you felt, what others said etc – the better. Now counter these by writing a letter in your defense stating how you felt and why s/he should have known better than to put you down. Post the letter to yourself, email it yourself, or put it under your pillow to read the next day. There are many more such exercises in the book. They are in addition to the daily Morning Pages and the weekly Artist Date prescribed. The important thing in this week is to feel safe – don’t stress, obsess, but don’t skip either. Daily Morning Pages. Three pages of free writing without thinking. Do not read them. Do not share them. Do not judge them. You can write to-do lists, describe how you big toes hurts, write why you hate to write, write your dreams, write an imaginary letter to an alien. But keep writing those three pages. Artist’s Date. Take yourself out for a treat – just one hour every week. Do let me know how you’re getting on. And we found _________ in a trunk in the attic……. I am in sync with WYHO lessons- wrote my morning pages after you introduced us to it and now this 1 hour of creativity per week is a great idea. The quote at the end is something which comes when faith wins over fear. I think I myself holds back and no one ever stopped me. I missed linking up. 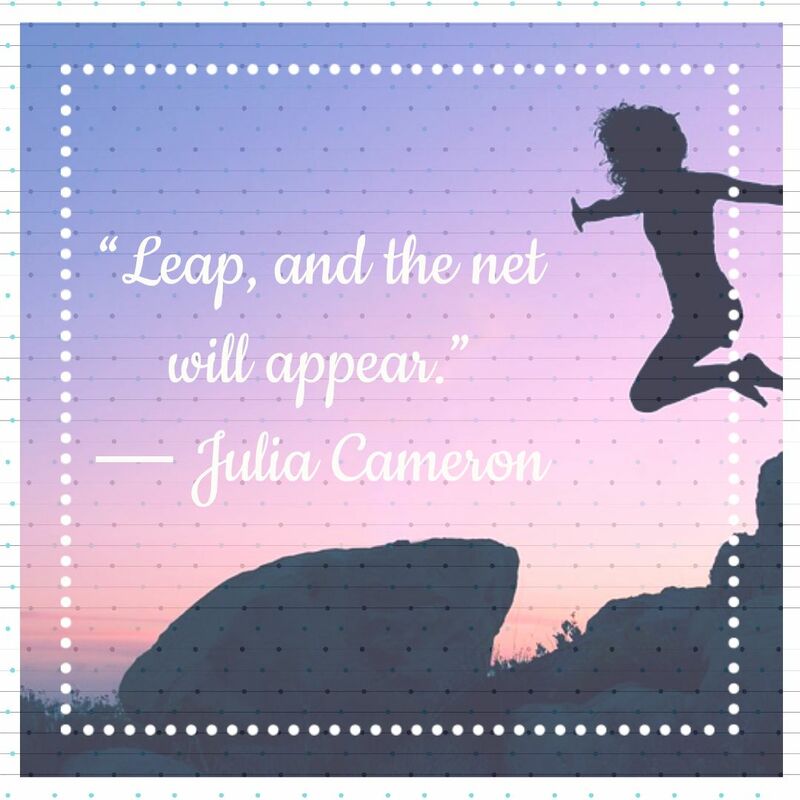 I’m always impressed and amazed by how many fellow artists follow Julia Cameron. I have my morning pages notebook open in front of me right this second. The lady would be happy to know I’m on fire with short story rewrites. Be well! Inspiring to read. Right now, I have to be more inspired; we are facing some challenges concerning the future of my developmentally disabled brother in law. I know how the system works, and we fact this battle for the rest of our lives. It will never end. This is superb. I will try to write by tomorrow or try to write next week. This sounds so surreal and therapeutic. How exciting to be working through The Artist’s Way – well done and all the best as you explore your creativity throughout the year. I look forward to reading more about your journey! AN inspiring read as always….I am stuck on the picture quote ‘Leap, and the net will appear…’ I think it has set the pace for today….will be pondering over it for a long time….I like the idea of Artist’s way….When I start thinking of three people, I can only think of me, me and me….It is my own hesitating self that is topping me from taking that step I so much want to….I need to discipline this ‘me’…. Affirmations are so very essential to our growth both as individuals and as creators/artists. I’ve touched upon this very fact in my gratitude post as well…that sometimes self-love shows us the way forward and makes life so much more meaningful than we can otherwise think of. Great reminders from a great book that is a must for everyone!! Corinne, it is an unfortunate fact of human nature that it leans towards criticism and not encouragement. This is a valuable post to counter the dampening effects of such behaviour. One has to learn though to distinguish between constructive and destructive feedback. I just feel so inspired when I read these posts, it is so true that we feel we have to pursue so many other things in our lives yet we get told our artistic dreams are silly or a waste of time. It took me until 38 to say ‘stuff it’ I’m writing! Now my husband has started pursing his artistic talents too! I want my children to never forget how important their artistic side is and I want them to embrace it. This post true moved me! I liked the idea of identifying and tackling the root cause of all negativity which in turn is the roadblock to creativity. Thanks for sharing these invaluable tips. Keep us updated on your progress with this program. Okay. These are actually quite fascinating exercises. Made me think a lot about the number of people who used to mock the efforts for being different and creative over the years, saying that we should follow the dotted line… feels good in some way to know I didnt listen to them. I definitely should try writing those three pages every day. High time I declutter the stuff running in my head! Thanks for sharing the course, Corinne. Loved the prompts. I will write on one tomorrow. Is it okay if I link back here then? Or is it only for Thursdays?